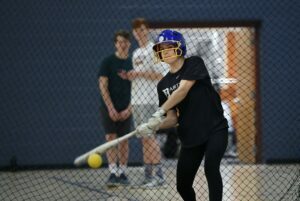 FALMOUTH — For the last two years, students who wanted to play softball for Falmouth High – and, truthfully, there weren’t many – had to drive to Portland for practices and games with students from Maine Girls’ Academy as a co-op team. This year, however, all they have to do is walk across their own parking lot to their field. And they are thrilled. 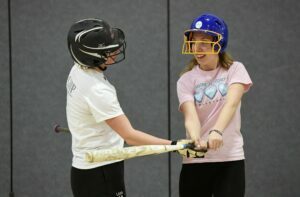 For the first time in three years, Falmouth will have its own softball team. The sudden closure of Maine Girls’ Academy last July spurred the decision by Falmouth to field its own team, but school officials were looking to do so even before MGA closed. The Yachtsmen have a roster of 17 players, including 10 freshmen. When Falmouth joined MGA as a co-op team in 2017, only 10 players had signed up to play softball and half had never played the sport before. The co-op team with MGA, which featured six Falmouth players last year, won 10 games in two years and made the playoffs in 2017. The Falmouth students enjoyed their new teammates and coaches. They just didn’t like having to drive to practice and games. Finding the right coach to revitalize the program was not an easy task. The school posted the position for 30 days but did not get any candidates. “Just me,” said Coffey, who in the past had been an assistant coach in football and baseball in Winthrop, Massachusetts, but never a head coach. He had worked hard the last two years in trying to get the program back on track, walking through the halls and cafeteria and talking to students about joining the softball program, working with the middle school program to get the numbers up there. “We’ve had nothing but constant support from him,” said Ladd. Coffey will rely on Fortier and Ladd to set the tone for the new program. Already in practices, Ladd can be seen taking freshman players aside to show them the correct way to throw the ball, the correct batting stance. Sophomore Maddie MacDowell returned to the sport after taking last year off to concentrate on gymnastics. Baseball is in her family bloodline: brother Matt played at Dartmouth College, brother Connor is a senior at Oberlin College and major leaguer Ryan Flaherty is a cousin. So she wanted to be part of the new program.